The Apollo is a beautiful white butterfly, with highly variable markings. 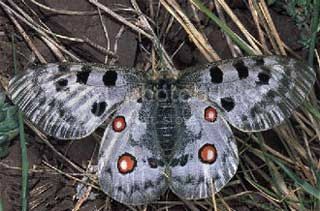 In general, the wings are shiny, with slightly transparent edges; there are a number of large black spots on the forewings and large red to orange spots on the hindwings. The caterpillars are velvety black with orange-red spots along the sides. These butterflies are mountain-dwellers and it is thought that the species became widespread during glaciation periods. Following the ice age, as temperatures increased, populations became isolated in mountainous areas; they subsequently evolved into distinct races and subspecies that vary greatly in the number and intensity of their markings.